We got a lot done, but not all of it. The roosters are still terrorizing me. Roosters in the spring are awful. We're hoping to get that done this weekend before the babies get here. I don't want them anywhere near the goats when they are kidding, or after either. Anyway, we did get some potatoes buried (will one row be enough? ), the garden fence put up, and the goat room ready for the kidding. The new goat room used to be the chicken coop. 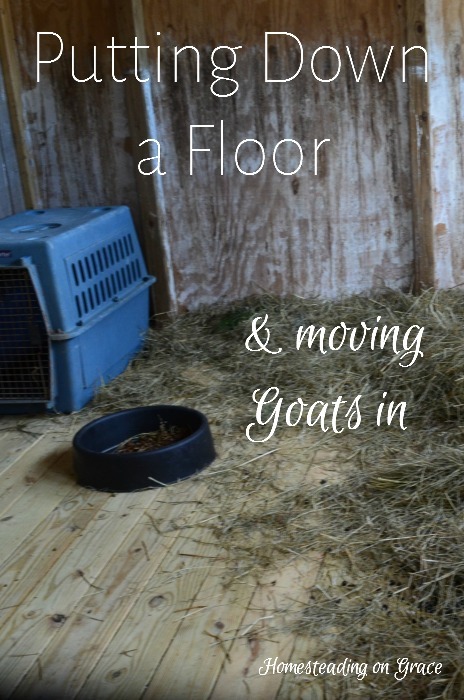 We (ahem, Jeremy) built the new chicken coop over the summer, and we wanted to put a floor down in the old coop room for the goats to use for kidding and us to use for milking. So Jeremy went to work. Even though the man has been cursed with this garage-turned-barn that is about as square as a triangle, he still always figures out a way. Putting down the floor took measuring each piece, notching out pieces, and even ripping the final piece at a diagonal. He got it done! And it is so nice and sturdy. The goats did not think so. If you want to keep a goat out of a place, try to lure, push, bribe them into the place. If you want goats to go into a room, try to keep them out. Apparently, goats are stubborn. 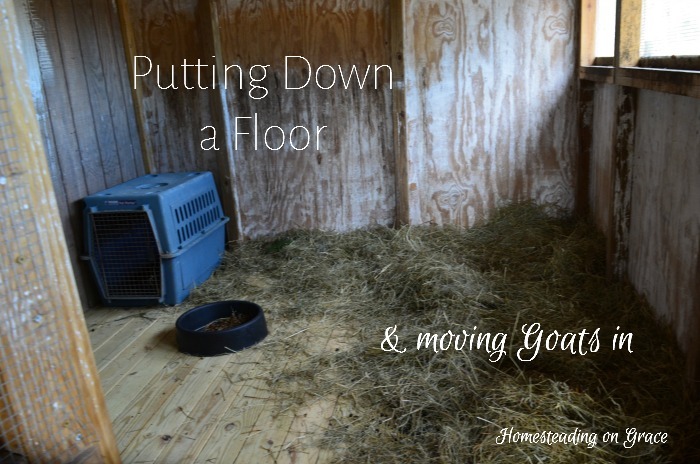 Both goats acted like the new floor was a killing floor, and would not step foot on it. Sissy has been sick, so she was even worse about it. Pippy eventually got curious enough to come in and check it out. We left their food in there, bribed them with pine needles and greenery, left hay and water in there. But Sissy was not going in. Jeremy finally shoved her in and we left the both of them in there for a night to get used to it together. We'd like to separate them, in case one goes into labor and the other gets in the way, but we also don't want to stress them out. I think we'll be able to separate them for a night or two before the kidding starts. They did well the first night together. We are the worst about getting ready for new babies around here at the last possible minute. We're almost there, though, I hope we make it! Anyone else getting ready for farm babies for the first time?